At least once a year, I take my theatre students over to Astor Place, where we stand on the corner of Astor and Lafayette and rehearse the events of May 10, 1849. Shouting over the ever-present construction, I point out the area as it had been, from farmland to pleasure garden to mansions for the “upper ten.” We look at where a Kmart and Starbucks now sit on the site of the Astor Place Opera House, figure out where the militia set up their guard as rioters poured in from the convening streets, and where almost one hundred people were shot, twenty-two of whom were fatally wounded. This is, of course, part of the story of the Astor Place Riots, a series of disruptions and actions that are central to the history of nineteenth-century American theatre, and the subject of my current research. 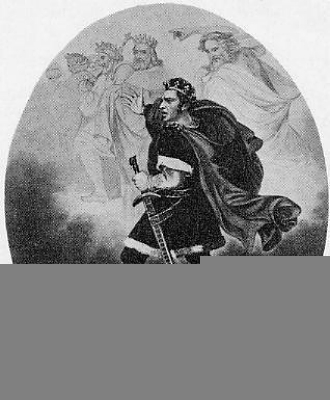 Most of the events are well-known, such as the feud between the American Edwin Forrest and the British William Macready (both of whom are depicted as Macbeth in their links), and have been well-documented by Richard Moody (1958) and Peter Buckley (1984). Despite the presence of such terrific work, I have long had a fascination with the riots, but each time I think about working on them I have to ask: why study Astor Place? Pardon the pun, but they have nearly been done to death. May 7: William Charles Macready, an English star took the stage at the genteel Astor Place Opera House to play Macbeth. Contrary audience members hissed, booed, and protested his presence, and, arguably, the theatre’s presence as a restricted place of refined drama and opera. Macready continued some of the performance in dumbshow, a common response to uproarious audiences. Afterwards, he swore to leave the country. May 10: Many prominent New Yorkers petitioned Macready to stay and give another night as Macbeth. Having been promised safety and a peaceful performance, Macready stayed. On May 10, the new mayor of New York agreed to order the militia to guard to Opera House. When the show started, numerous rioters disrupted the performance inside. Many more outside massed in Astor Place and attempted to vandalize the building. The militia calvary charged but were repelled. Finally, the order to fire was given and 22 people were killed, many of whom were onlookers (which suggests there were multiple kinds of rioters present, from participant to audience). In the following days, more protests formed, and several thousand marched on the Opera House, but were repelled by a well-organized militia presence. The city was nearly shut down, and for several days, police heavily patrolled the streets (though, to my knowledge, mostly moving from bar to bar). Many feared a second American Revolution along the lines of what had been going on in Europe a year before. Historians have written extensively on what caused the riot (usual suspects: a feud between Macready and Forrest, class antagonism, American nationalism) and its effects (allowing for separate entertainment venues for separate classes). The answer to “which is of these was the case” is probably “yes,” so what I am interested in is how contemporary New Yorkers at the time interpreted, viewed, and represented the riot. I presented a paper on the visual culture of the riot, but here I am using a few analytic and visualization tools to get a general sense of how people wrote about the riots in their aftermath. While much attention has been paid to the events of May 7-11, I aim to explore the wider reception of the riots in American culture. Instead of examining into causes or guilt, I am going to look for how contemporary New Yorkers thought about the riot, and how the riot was re-interpreted over time. In most political events, from elections to revolutions, there is a secondary fight over the interpretation of the what has just happened. As we have seen in the recent shutdown, politicians, pundits, editors, and the public has been (and still is) engaged in a fierce contest of facts and ideologies. I hope to see how Astor Place was marshaled in contemporary discussions, and how it was resurrected to serve dialogues over civil disturbance, police action, and social organization throughout the nineteenth century. At the moment, I am looking at nineteenth-century writings on the riots through text mining and data visualization tools. My work is currently in the beginning stage of assembling a corpus and playing with the data, but I plan to use word count, key words in context, and network visualizations (among others) to look at the relationships among the many texts that engaged the riots. Already I am impressed by the sheer volume of relevant material in the decades after the riots, which suggests that the events of May 1849 left a long footprint over the century. What do you do with a footnote to a footnote to history? This entry was posted in Theatre by rdavis. Bookmark the permalink.